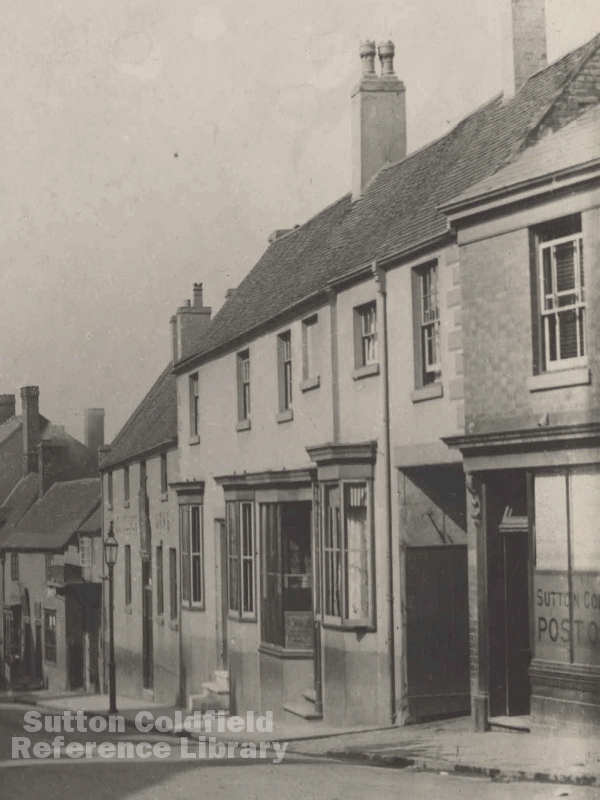 In 1764 there was a public house in Mill Street called the Bulls Head. It was part of the Sutton Coldfield estate of Emmanuel College, Cambridge. In 1594, when the college purchased the estate, it was listed as a private house. According to a survey of the college property made in 1638 the tenant was a gentleman, Mr. Hannum, but by the end of that century it had sunk to the status of an inn. A list of Sutton licensees of 1761 gives William Terry at the Bulls Head. By 1764 the Bulls Head, an ancient timber-framed building, was in a poor state. The Master and Fellows of Emmanuel College renewed the lease of their Sutton estate to John Kendrick on condition that he maintained the estate in good order. Amongst other things, they stipulated that he “pull down the Bulls Head and the tenement adjoining”, and within two years erect on the site a new house “of the length of forty feet fronting the street and of the width of twenty-two feet” with five bedrooms, all of good quality materials and at a cost of at least £150. Apparently the old Bulls Head was knocked down and new buildings erected on the site, but not of the high standard specified in the lease. The new building is referred to in the Corn Rent Schedule of 1824 as belonging to Emmanuel College, tenanted by Robert Betts and described as “The Sun and yards etc.” Assuming this to name to be correct, it would account for another inn, which stood in Coleshill Street, being known as the “Old Sun”. Robert Betts was a native of Sutton, aged 24 in 1824; he was still at the inn in 1841, but the 1851 census gives his widow Martha as landlady of the inn, known by now as the College Arms. The inn was a meeting place for the town’s dissidents with grievances against the self-elected Warden and Society which governed Sutton. In 1853 resentment at the failures of the grammar school were expressed in a “memorial” signed by over 150 inhabitants, and on Monday March 14th placards were displayed inviting anyone interested to a protest meeting - “The Memorialists meet at Betts the College Arms this evening at 6 o’clock”. In 1900 the landlady was Mrs. Price, who placed an advertisement in the directory for that year for “the College Arms Hotel. Ales, wines and spirits of the finest. Cigars of the best brands. Parties catered for. BILLIARDS.” Two doors further up Mill Street was Sutton Coldfield Post Office in rather cramped accommodation. The Emmanuel College Arms was demolished in 1908 and a new post office was built on the site, opening in 1909.